COMMONS Speaker John Bercow has selected seven amendments for consideration as MPs aim to shape the next phase of the Brexit talks with the EU. Opening a crucial day of debate in the House of Commons, Theresa May urged MPs to give her ‘the clearest possible mandate’ to go back to Brussels and reopen Brexit negotiations with the aim of replacing the controversial backstop. ■ Amendment B, a move by Labour former minister Yvette Cooper to give Parliament control over the Brexit process if Theresa May fails to secure a deal by February 26. This ultimately seeks to allow MPs to vote on a Bill which extends Article 50 and prevents a no-deal Brexit. ■ Amendment N, senior Tory Sir Graham Brady’s proposal to replace the controversial Northern Ireland backstop with ‘alternative arrangements to avoid a hard border’. ■ Labour’s amendment A, which aims to allow MPs to vote on options to stop a no-deal exit, including a customs union and the possibility of a second referendum. ■ The SNP’s amendment O, which seeks an extension of the Article 50 process and rules out a no-deal Brexit. ■ Amendment G from Tory former minister Dominic Grieve, which also bids to prevent a no-deal Brexit and allows MPs to effectively wrest control of Commons business from the Government for six individual days in the run-up to the UK’s scheduled withdrawal date of March 29. ■ Amendment J from Labour MP Rachel Reeves, which seeks an extension of Article 50 if there is no Brexit deal approved by the Commons. ■ Amendment I from Tory former minister Dame Caroline Spelman, which again seeks to avoid a no-deal Brexit. 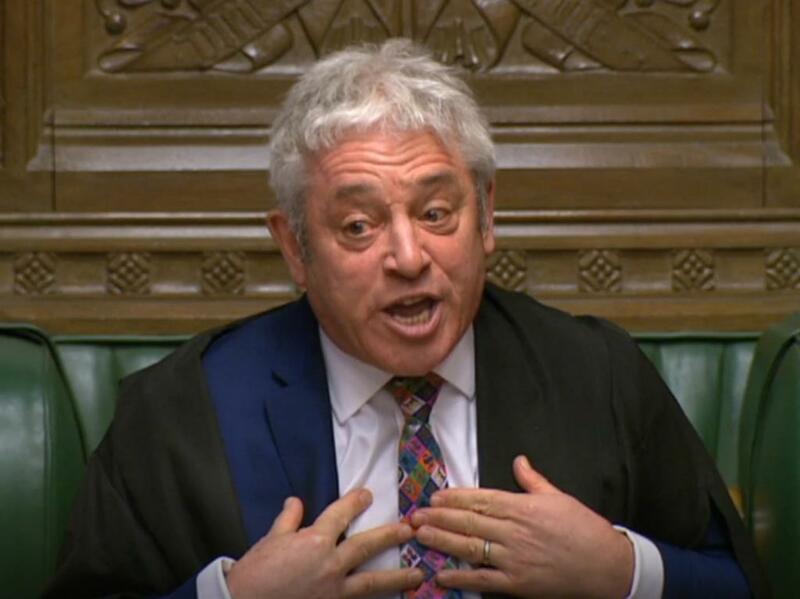 Mr Bercow said the order of the amendments was A, O, G, B, J, I and N — although it is up to those behind them to decide if they want to push them to a vote. Mrs May appealed to MPs to ‘send an emphatic message’ about the Brexit deal they wanted after they rejected her Withdrawal Agreement by a 230-vote margin earlier this month. She called for them to send an ’emphatic message’ to the EU by backing an amendment tabled by Tory grandee Sir Graham Brady which would require her to replace the backstop with ‘alternative arrangements’ to avoid a hard border in Ireland. Also up for debate is a cross-party proposal from Labour MP Yvette Cooper and Tory Nick Boles — backed by the Labour frontbench — which would hand control over the Brexit process to Parliament, potentially delaying departure day from March 29 to the end of the year. Mr Bercow also selected Jeremy Corbyn’s own amendment — which would allow debate on Labour’s preferred plan or a second referendum — as well as others which would rule out a no-deal Brexit, extend the two-year negotiation under Article 50 or permit a series of ‘indicative votes’ to establish the will of the Commons. 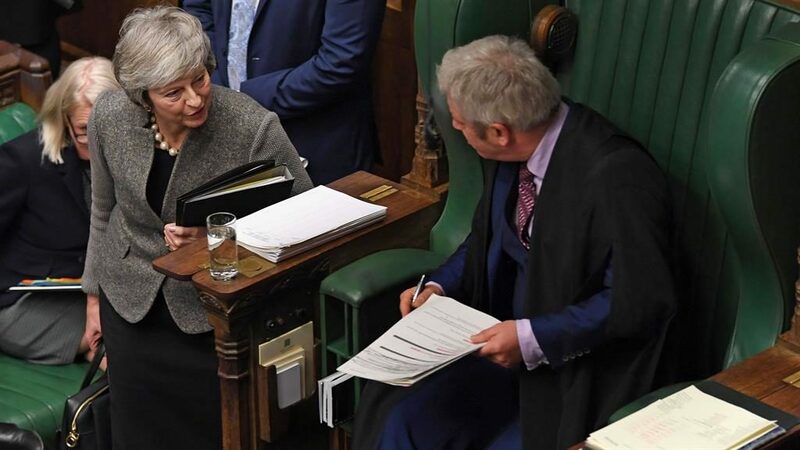 In an attempt to fend off possible rebellion by Tories seeking to avoid a no-deal departure, Mrs May promised that tonight’s votes would not be MPs’ final chance to pass judgment on EU withdrawal. She told the Commons she aims to return to the House ‘as soon as possible’ with a revised deal, which will be subject to a ‘meaningful vote’ of MPs. If defeated, she will table another amendable motion for debate the following day.